This Bissell floor scrubbing machine can be operated at two speeds, 175 RPM and 300 RPM. The change in speeds is simply accomplished by flipping a switch. Instantly the machine switches speeds! This is extremely useful when scrubbing and buffing floors. Use a slower speed to buff deeply embedded scuff marks and scratches. Then flip to the 300 rpm setting to give it a nice, high shine. The Bissell scrubber will not produce the same results as our high speed polishing machines, but it will achieve a decent shine. Use in conjuction with our floor buffing chemicals listed below for your best results. Looking for a floor buffer scrubber in a different size? We have plenty of alternative models to fit your needs. 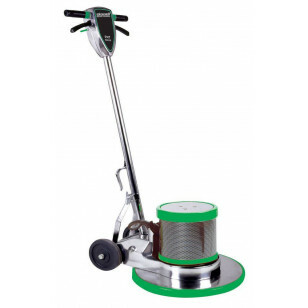 Or, if you're looking for something that can cover more ground, feel free to take a look at our complete line of walk behind scrubbers for other great options. Safety enhanced interlock switch ensures both hands are in control of the machine. Non-conductive dual triggers eliminate shock potential. 5 year warranty on motor and gearbox.